Abidec Multivitamin Drops have been specially formulated to help meet the nutritional requirements of your children. It is particularly beneficial in the prevention of vitamin deficiencies. Abidec Multivitamin Drops are rich in 7 essential vitamins. Given daily, Abidec Multivitamin. Drops provide the correct balance of vitamins to maintain your child's healthy growth. Abidec Multivitamin Drops should be given orally, once each day. Place the drops directly on the back of the tongue using the syringe provided. Ensure the syringe is washed (not in a steam steriliser) then dried thoroughly. Store syringe in a clean dry place until next use. Syringe for use with this product only. After each use reseal the bottle with the original cap. 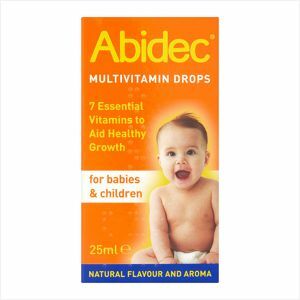 Abidec Multivitamin Drops have been specially formulated for babies and children and are not recommended for adults. For best results vitamins should be given every day. Product may appear cloudy. This does not affect its nutritional properties.